When he said, “very soon after we started going out, I knew I had found someone special,” Stephen was speaking to a room full of people at their Palmerstown House Estate wedding, but it seemed like to him the only person that mattered was the one standing at his side, smiling at him. It was great to see a couple so obviously head over heels for one another. The speech was a really special moment, one of many in what was a genuinely lovely day. 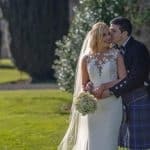 The venue was Palmerstown House Estate in Co. Kildare and there are some shots of the newlyweds walking hand in hand through the incredible grounds that I really love. They were lucky enough to get a bit of sunshine on the day and so they were able to make the most of what gardens had to offer. Of course, Niamh the bride was stunning and, as you’ll see when watching the preview, spent the day laughing and smiling. There was a real sense of fun at this wedding, along with some really touching, heartfelt emotion – not least in Stephen’s speech! Watch their 60 seconds coming soon wedding film.